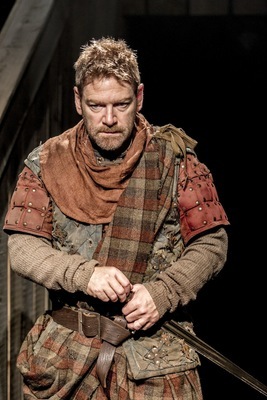 For a brief week, the Seattle International Film Festival was able to bring Manchester International Festival’s production of Macbeth to the Uptown Theater in Seattle. As a part of a series called National Theater Live (which includes Othello with Adrian Lester and Frankenstein with Benedict Cumberbatch and Jonny Lee Miller), this production stars the illustrious Kenneth Branagh as the titular Scottish King. I was lucky enough to get tickets to see this thunderous play. Co-directed by Branagh and Rob Ashford, the production was spectral, but appropriately stark. A lot of the eerie desolation came from the fact that it takes place in a deconsecrated Manchester church. The floors of the church were ripped out, so the stage was a pit of austere earth across which the witches skulked and the Scottish thanes clashed bloodily. Rain was poured unsparingly onto the actors. The dim lighting was the perfect harshness for this sinister play. He is matched in every way by Alex Kingston’s performance as Lady Macbeth. In my opinion, Lady Macbeth is the most succulent role of the Scottish play—and Kingston’s performance was violently impressive. Even as someone who is very familiar with Macbeth on page and stage, Kingston’s ferocity often took me aback. It takes guts to invest that much energy into a character who is so cruelly ambitious that she is willing to dash out the brains of her own infant in order to gain power. The tumult of scene after scene works to propel the plot extremely effectively. Every moment seems urgent, and every word seems to burn with intensity. No one is a letdown—from John Shrapnel as a jolly and naïve King Duncan to Ray Fearon as a sturdy Macduff to Rosalie Craig, who stands out in her singular scene as a surprisingly fierce Lady Macduff. This National Theater Live production of Macbeth is truly grotesque—in the best way possible. The feral movements of the scenes showcase the savage glory of Shakespeare’s work. A breathtaking performance of a vicious story, it is at once fair and foul.